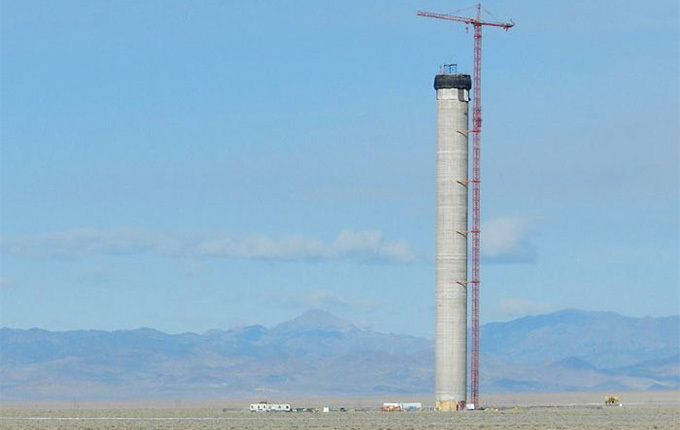 Sponsored by SolarReserve, the 100MW CSP (Concentrating Solar Power) solar power tower is said to be the first of its kind in the US and the tallest molten salt tower in the world. The project is being built on 1,619 acres of land leased from the Bureau of Land Management in Tonopah, Nevada. The Crescent Dunes Solar Energy facility is expected to avoid nearly 290,000 metric ton of carbon dioxide annually and produce enough electricity to power over 43,000 homes. The CSP project will generate power with molten salt as the main heat transfer and storage medium for the system. It plans to use 17,500 heliostats (mirror assemblies) that collect and focus the sun’s thermal energy to heat molten salt flowing through the 640-foot tall solar power tower. The high temperature molten salt circulates from the tower to a storage tank, where it is then used to produce and generate electricity. Excess thermal energy is storage in the molten salt for about 6 hours after sunset. The molten salt is not explosive, and any leaks would solidify. Solar power produced by the Crescent Dunes project will be sold to the Nevada Power Company, a utility subsidiary of NV Energy. ACS Cobra’s Nevada-based affiliate, Cobra Thermosolar Plants will serve as the project’s general contractor. The project is anticipated to generate over 500,000MWh per year of solar electricity. Density: 47-55 lbs. cu. ft.